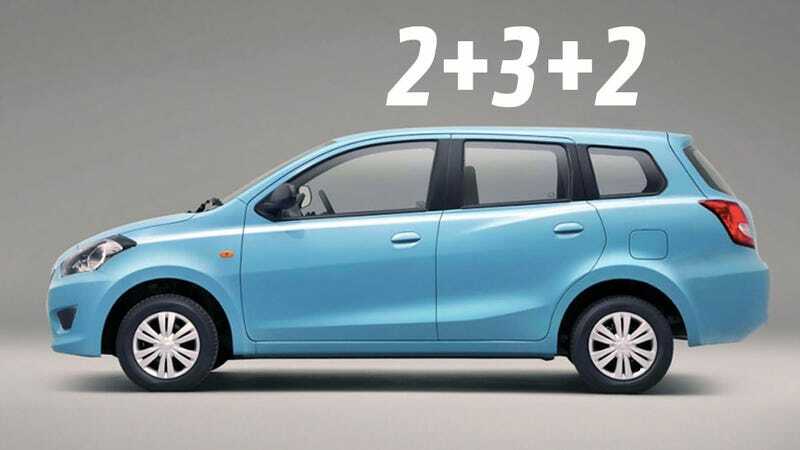 Datsun went to Indonesia to unveil the second car in the reborn Datsun line, a seven-seater MPV called the Go+. Well, it's really more of a 5+2 seater, and if we're talking America, it's probably more of a 4+dog seater. But it's not for us in the US, so expect this to hold well over seven people. It's very closely based on the Go hatchback that was introduced in India earlier this year, and the the MPV appears to be very heavily based on the hatchback, with similar styling, the same 1.2L three making 68 HP, and much of the same interior layout and bits. That includes a front semi-bench seat, integrated smartphone dock taking the place of an audio/nav system, and, in the case of the MPV, a folding third row of seats. An MPV design is a smart, if obvious, choice for emerging markets, where cars are often pressed into holding many more people than they were optimally designed to. The car should sell for about $8500 US, which is a bit more than the smaller Go hatchback.